Home / Buffalo / Buffalo Healthy Living / CM / Daily Update / good for the neighborhood / Health / Independent Health / News / BUFFALO HEALTHY LIVING: Independent Health presents "Back to School in Good Health"
BUFFALO HEALTHY LIVING: Independent Health presents "Back to School in Good Health"
BUFFALO, N.Y. -- With a theme of "Back to School in Good Health," many tools and resources focused on promoting healthy, active lifestyles will be available at the upcoming Independent Health Foundation's Good for the Neighborhood® program. Hosted by Building Unity through Community and the Town of Newstead, this event will be held from 6 to 7:30 p.m. Tuesday, August 21 at the Newstead Fire Hall and Akron Newstead Senior Center, 5691 Cummings Rd., Akron, NY. Good Health is the best back-to-school supply your family can have, so don't miss the free Good for the Neighborhood Back-to-School Health and Safety Fair that combines health and safety education with fun for the whole family! During the free events, all participants will be encouraged to set healthy goals. To support them in leading healthier lifestyles, Good for the Neighborhood® will offer a free farmers' market coupons with fresh fruits and vegetables, as well as health screenings for blood pressure, glucose, cholesterol and body mass index. Established in 2006 by the Independent Health Foundation, Good for the Neighborhood is a free, community-based wellness program that brings health-related training and tools to areas where access to health care is limited. Individuals and families are encouraged to manage and improve their health by attending quarterly health fair style events and workshops. 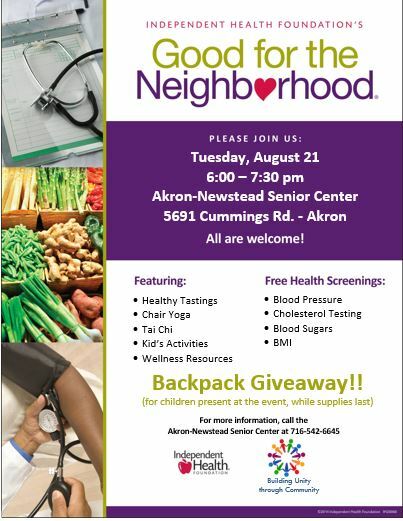 Good for the Neighborhood offers valuable health and wellness resources to participants where they live, work and play. *The giveaway is available while supplies last at each event, which are open to the public on a first-come, first-served basis. Attendees need not be members of Independent Health, but a child must be present to receive the free supplies. For any questions regarding this release, please contact Natalie Cook, Community Impact Coordinator with the Mobile Safety-Net Team at ncook@msntwny.orgor 716-830-5636. Thank you. The post Good for the Neighborhood appeared first on Buffalo Healthy Living Magazine.